Early June, cooperation between the Hunebedcentrum (NL) and St Fagans (WLS) resulted in an exhibition. This is a presentation of Welsh megalithic monuments, their history and purpose through times. ‘Shadowlands’ as the exhibition is called would never find its way to the Netherlands if not both museums had met in the backdrop of the OpenArch project. This project unites 11 organisations, all of them EXARC member, for a period of 5 years. Other partners in OpenArch, also with a Stone Age background, have already shown interest – maybe ‘Welsh Stones’ will conquer Europe once again! 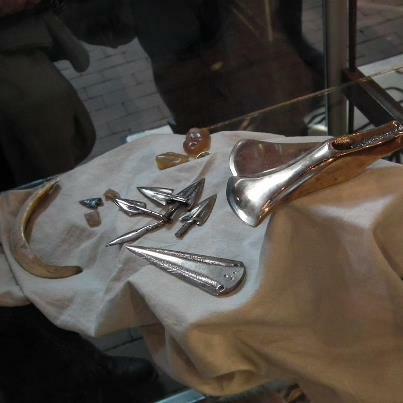 The exhibition contains many replicas (jewellery, tools), scale models and a face reconstruction. Shadowlands will be on show until March 2013.